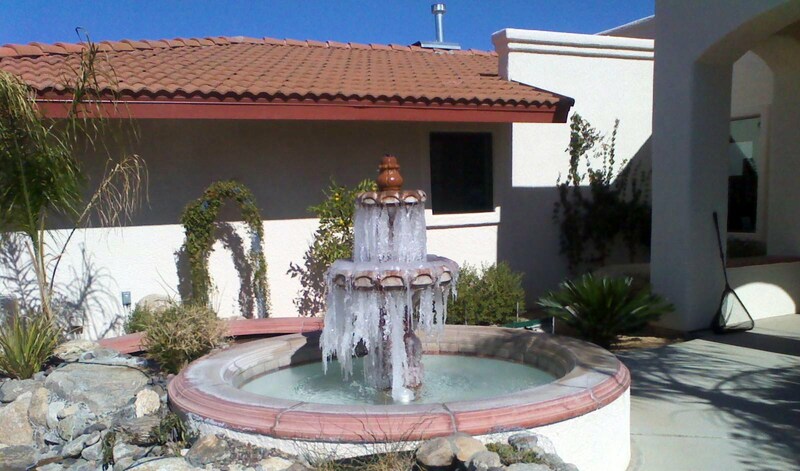 For all of you crying over the weather in other parts of the country, I wanted to show you the fountain in front of my brother's house in Tucson, AZ. So don't hate them for their 70 degree days. They get cold snaps too, you know! I'm enjoying the cold while it lasts! Next week it'll probably be warm again here! Ok Salena, so I'm a cry baby! I do have to laugh though cause I'd be crying if I was in Tucson right now too! In case you didn't know this...I HATE WINTER!!! I have never been an extremeist, as I am not a fan of summer either. Just give me Spring and Fall and I am happy! Thanks for sharing this photo. Made me have a moment of silence for your family as well as my friend! Love the picture but am hating the cold. It was 18 degrees last night and the pipes were frozen this morning. I'm grateful I'm not in NY anymore but enough is enough. I'm a summer baby and can't wait for Tucson's spring/summer. LOVE your posts. I'll trade a frozen house and yard for that fountain about now! Still that beautiful clear blue sky in the background.